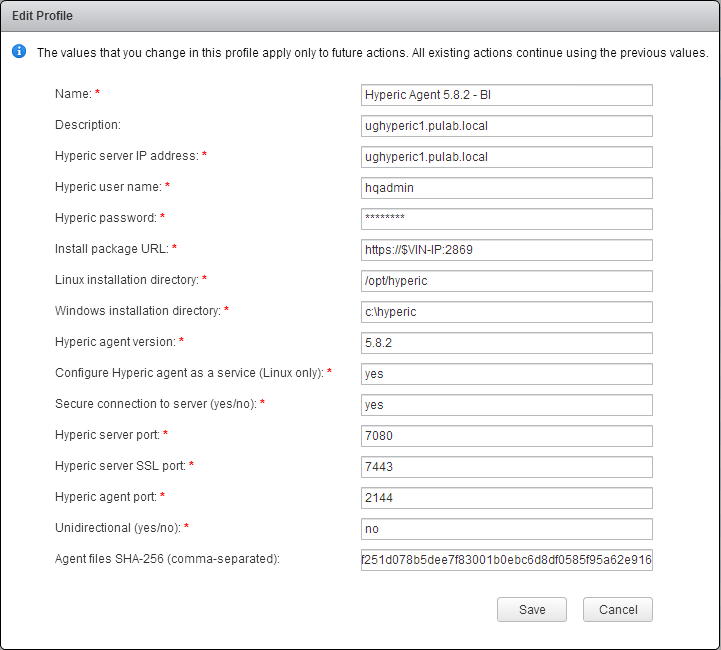 As already mentioned here, VIN 5.8.2 contains the vCenter Hyperic agents files in version 5.8.0. I have already tried to upload there version 5.8.2, but unfortunately without sucess. And now we have appropriate KB, clear and transparent like the morning mist. Fortunately, thanks to the previous attempts more or less understood what they meant and decided to complete the process (though lately I’ve been very close to success). Let’s start with the preparation of new agents. VIN hosts files for Linux systems and Windows in 32 and 64 bit versions. The relevant files can be downloaded directly from the vmware.com or “pull” from the directory in which you installed the full version of vCenter Hyperic (with agents), this applies to both versions, delivered as an appliance and on the Windows version (hyperic/server-current/hq-engine/hq-server/webapps/ROOT/WEB-INF/hq-agent-bundles). Prepare a package containing the relevant agent files is not easy, KB is not entirely truth, we need to perform some additional steps. Fortunately, we can use several parallel versions of the agent. In view of the fact that the VIN appliance does not have a command zip, agents intended for Windows can be formed beforehand on the system containing the command. Crafted files will be able to use in one Infrastructure Navigator two different versions of vCenter Hyperic agent. We can of course override the version 5.8.0 crafted version 5.8.2 and it will work. The last thing you need to do is generate sh256 control hash for the newly generated files. This is not a mandatory step, we can delete in the agent profile checksums, and also it will work. Due to security it is better to not skip this step. Acquired checksums paste in the filed “Agent files SHA-256” (separated by a comma). That’s all, we have prepared new profile. 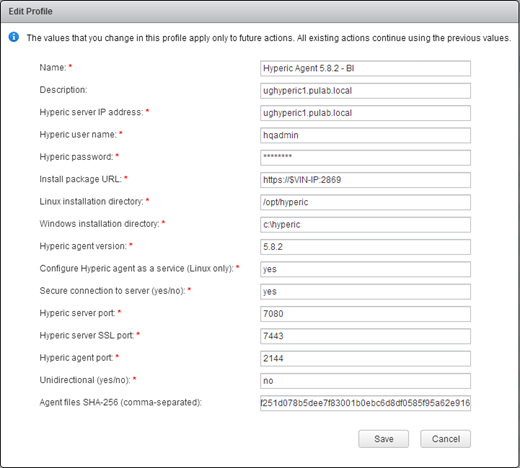 Unfortunately, we do not upgrade the agent version already installed and running from the vSphere Web Client by performing the action “install” for the newly created profile. This operation is possible only from the vCenter Hyperic (or manually).